When an English socialite becomes stranded in the middle of a gold rush, her money depletes quickly even while her prospects for marriage increase daily. But Abby Effingham is on a mission to find her mother-not romance. Will a ridiculous scandal keep her from traveling on, or will it wake up an aloof innkeeper to the treasure right under his roof? 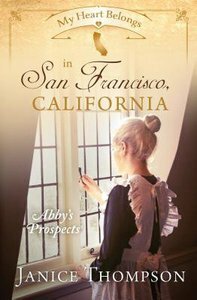 About "In San Francisco, California - Abby's Prospects (#08 in My Heart Belongs Series)"